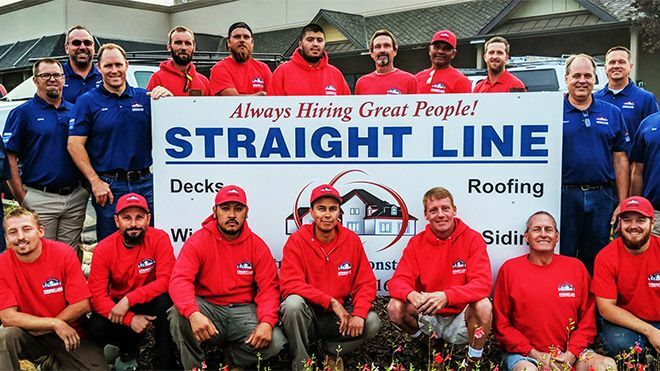 If you are interested in working for Straight Line Construction please complete the form below. Do you want to work all year long? Join a company that consistently provides work to all our crews! Carpenter – Experience with residential exterior remodel. Framing – Decks Siding – Windows & Doors. TEAR OFF Laborers: Physically demanding/rigorous work removing old roofing material and other tasks as directed. Carpentry skills desired for dry-rot repair. ROOFERS: Apprentice AND Journeyman Level. Assist foremen with all phases of roofing. JOURNEYMAN ROOFER: Experience with composition a must, tile, single ply, metal, dry rot repairs and sheeting are desired as well. Must have own tools. APPRENTICE ROOFER: Experience with one type of roofing, willing to learn, be flexible, and assist both roofing crews and tear-off crews. Print and mail it in.